The US Open Men’s and Women’s finals are on this weekend. Who do you want to win the tournament? My drawing is of a player, staying low, to perform a forehand return. Much like Osaka’s brilliant technique which she used to beat Madison Keys in the semi-final. This was a fun sketch to do because of the simplicity and flowing lines to capture the human form in action. It is too bad American John Isner does not advance to the Men’s final after his epic battle with Anderson yesterday. Isner has the record of the longest game in tennis history, against Mahut at 11 hours and 5 minutes. And now his semi-final match with Anderson is the second longest in major history at 6 hours and 36 minutes. Yikes! Andy Roddick was the last American to reach the Wimbledon finals when he played against Federer back in 2009. That was an epic battle in itself. It was Isner’s goal to be known more than for his record long matches, and to be the first American since Roddick to reach the Wimbledon finals. I applaud you Isner for almost accomplishing that feat. This weekend is the Wimbledon finals. Any guesses of who will win this year? Djokovic, Nadal or Anderson? Kerber or Serena Williams? 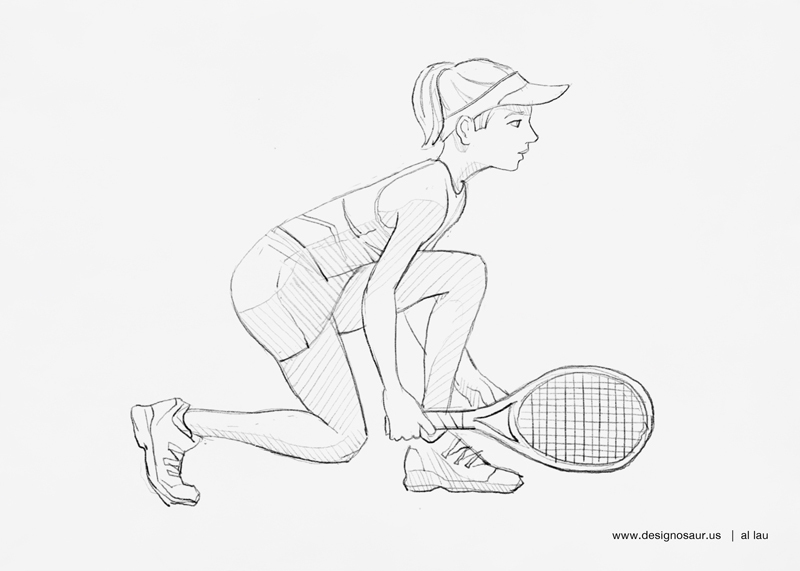 My fun little drawing is a player preparing to do a running forehand. It’s that time of year for Wimbledon! Tennis coverage begins at 7am EST Monday July 2 on ESPN. My drawing is of a lady tennis player getting ready to serve an ace. Tennis is my favorite sport to sketch. Have you noticed? Happy 4th of July, everybody! I know the big news is the Royal Wedding. Did you wake up at the crack of dawn to watch it? In other European news, the French Open begins soon. My drawing is a player doing an overhead smash. That is the best move to counter an opponent’s lob. Smack! There is a different kind of tennis doubles stance where a player crouches on the middle line of the court, just behind the net, while the server has a plan of attack. It is called the “i” formation. The doubles players have a strategy that will confuse their opponents. The problem is, this positioning is only effective if the first serve goes in. My drawing shows the player ducking low enough so that she won’t be hit by the server’s tennis ball. One of my fave tennis tournaments is coming up next week, the Australian Open. But before that, the Hopman Cup is happening in Perth. This is my way of fantasizing warmth during this record-breaking cold we are having in the Northeast. The Wimbledon finals happens this weekend. Venus Williams will try to make history by winning the women’s finals at the age of 37. On the men’s side, Federer will also return to the finals as a 36-year-old. Both players are defying the odds by showing the sport that 30 is the new 20. My drawing, today, is inspired by Nadal’s aggressive forehand stance. We are midway through the Wimbledon Championships and there is much more great Round 3 matches to come, including the big four – Nadal, Murray, Djokovic and Federer. My drawing shows a player swinging a forehand motion with heavy topspin. Don’t underestimate smaller players in tennis. They can pack a big punch!